Minami Nutrition MorEPA Platinum is a premium Omega-3 supplement to help boost and maintain a healthy immune system. It contributes to the heart & brain function and provides vision support. 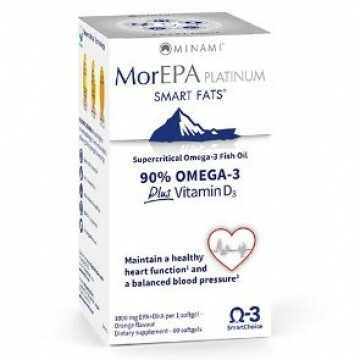 MorEPA Platinum is a premium Omega-3 supplement to help support and maintain a healthy immune system by delivering an unprecedented 1,100mg of Omega3 nutrition and 150% daily Value of Vitamin D.
Designed for adults who want a high concentration, premium, convenient, daily fish oil with the highest available Omega-3 concentration and added vitamin D3. MorEPA Platinum offers a clean, orange flavour with no fishy aftertaste.